The Unstationary Scaffold in transit in Portal. Good. Now use the Aperture Science Unstationary Scaffold to reach the chamberlock. An Unstationary Scaffold is a platform that, when activated, moves horizontally back and forth along a beam of blue light. It is used to access previously unreachable places and to bridge gaps over deadly substances or pitfalls. Some might stop after transporting the player across. The scaffold also appears in Portal 2 and utilizes a design similar to that of the Victory Lift. 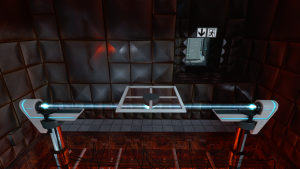 In the developer commentary of Portal, players learn that originally, the scaffold moved along a solid track, but playtesters found that they could cheat a level by walking along the track. Then, the developers made the rail 'electrified', so that contact with it would kill the player. This seemed harsh to playtesters, and made use of the scaffolds more difficult, as a slight slip could kill the player. The developers then moved on to the current design, where the scaffold is supported on a beam of light. This page was last modified on 14 August 2017, at 02:11.